Hey, were you wondering a fun way to share the gift cards you bought for your friends and family? 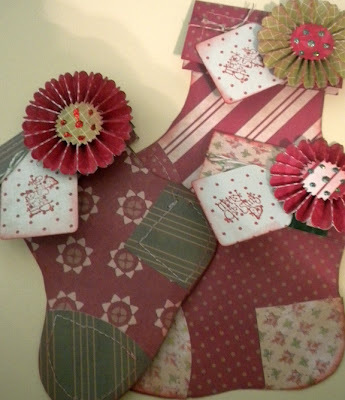 Why not make this darling stocking to hold them? I searched all over the Internet the last couple days trying to find something that was easy, and free. Here is a template that I found. : Template Thank you to the creator of this template, because they went together really quick. I added a paper rosette and a tag to mine. I was happy with the results! I ended up making 5 of these. Other than waiting for the stickles to dry, they went together very quick and easy. Perfect for the last minute idea! 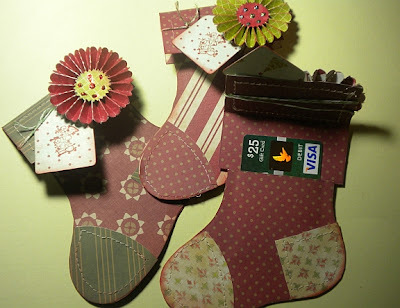 Raise the cuff flap and underneath is a pocket that holds the gift card. Pretty nifty!